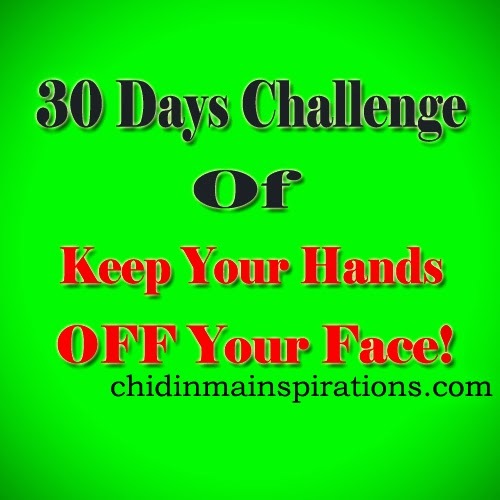 Chidinma Inspirations: Day 23 Of The 30 Days Challenge Of KEEP YOUR HANDS OFF YOUR FACE! Day 23 Of The 30 Days Challenge Of KEEP YOUR HANDS OFF YOUR FACE! We have 7 more days to draw the curtain down on The 30 Days Challenge! Who is excited about that? Who is sad about it? How was your day? I hope your day went well? How was the challenge today? Did you touch your face? Did you make a concious effort not to touch your face? Today went well. Thank God. I didn't touch my face today, so happy! *dancing* I was so concious of it today. So my dear people, how did your Day 23 go today? You can still join us if you are yet to do so. It is not late to join us. Here >>> chidinmainspirations.com/2014/12/keep-your-hands-off-your-face.html?spref=tw … is what the challenge is all about. You are really doing great in this challenge dear Anthonia. Do keep it up!